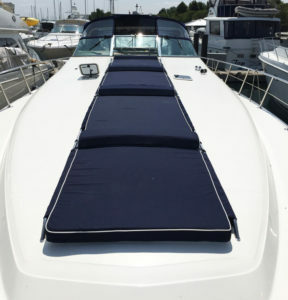 Chicago Marine Canvas provides interior and exterior marine upholstery work in all types yachts and boats. 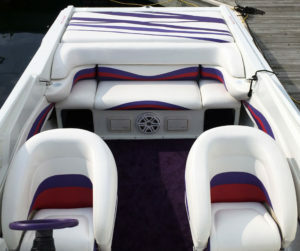 We can refinish or rebuild an existing design or develop a new one for your boat. 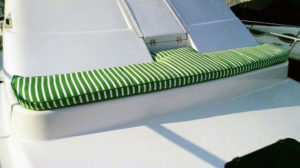 There are a variety of options available when it comes to marine upholstery. Just like when building a home, the foundation is one of the most important pieces of the upholstered item. Traditionally most frames are build from marine lumber which is treated for the outdoor environments. Even with time though, moisture will break down the wood causing to to crack and crumble requiring replacement. Sometimes an original frame can be reused but you never want to reupholster a piece with a rotted out frame. Painting wood will help in extending the life of a wooden frame but ideally a synthetic frame is preferred such as King Starboard. 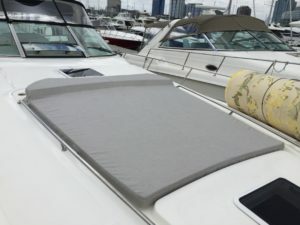 King StarBoard® is the original marine-grade high-density polyethylene sheet and the industry standard. It is the product of a proprietary process called K-Stran™, the most advanced manufacturing process for superior flatness and consistency. King StarBoard® is environmentally stabilized to withstand the harshest marine conditions. It will not warp, rot, or delaminate when exposed to humidity or water. King StarBoard® is easy to fabricate with standard woodworking tools and requires little or no finishing. Silvertex is a coated fabric engineered, tested and certified to resist the toughest conditions in marine environments. Anti-stain treatment, impermeability, UV-resistance, Cold Crack and Mildew resistance ensure that all requirements of the sector are met. It can be found on many of the new yacht models that you can see at the Chicago Boat Show in January too. It’s becoming an extremely popular option with the recent shift to a more contemporary design in today’s yachts. Chicago Marine Canvas will work with you through the entire uphosltery process, from framing to vinyl leaving nothing to chance. We have a wide variety of samples in our showroom of all of the above options and many more too. Please contact us to discuss your project.